I fell in love with Malaysia during my first trip to Kuala Lumpur in 2009. Being able to choose between great Indian, Chinese or Nyonya cuisine meant loads of variety – classic dishes tasted different but awesome no matter where we went. Three years later we returned with our first son (then aged two) and found even more to love in Penang, where the laksa was fishy and bitter and the spices were fresh and local. Since then we’ve struggled to find Malaysian food in the west that lives up to those glorious memories of eating chicken skewers by the side of a road drinking a cold teh tarik. When we find ourselves in Maribyrnong around lunchtime on a rare lovely day, I remember a tip from a friend to try Sambal Kampung, her preferred Malay restaurant. The other half doesn’t take much convincing. We are warmly welcomed and grab a high chair for our little guy. Our waitress brings him over a plastic bowl, cup, fork and spoon – a welcome surprise that no doubt benefits all parties concerned. 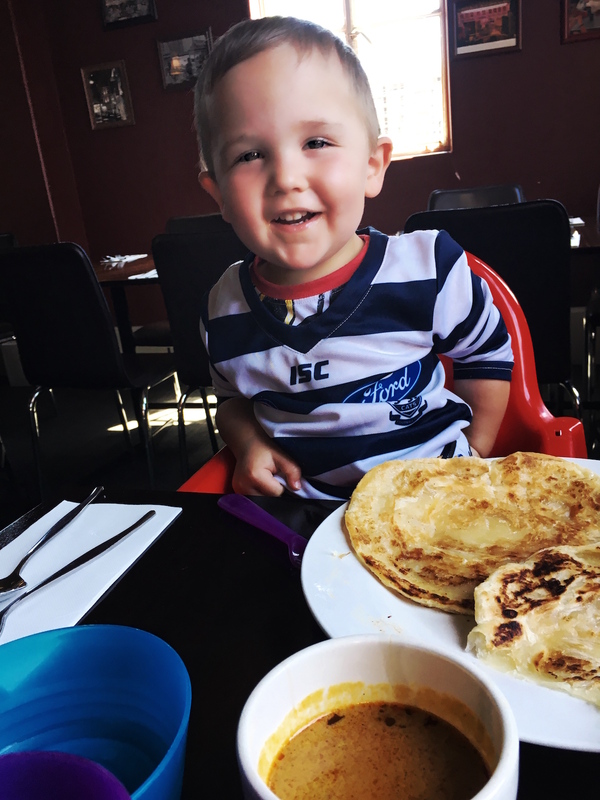 The little guy tucks in quickly to some roti canai. The rich, delicious curry sauce is just a bit spicy for him, but we are happy to ensure it isn’t wasted. The other half orders the chicken laksa with hokkien and vermicelli noodles ($11). 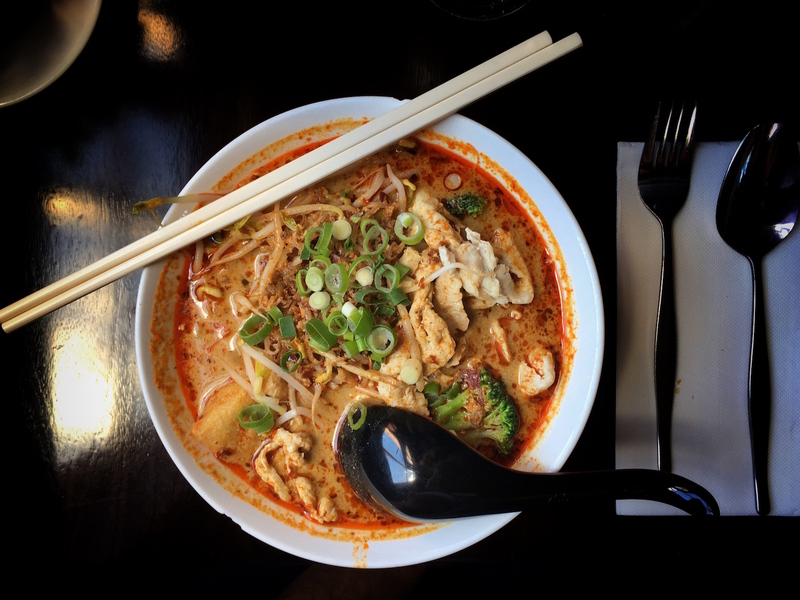 Laksa often takes a little while to fully appreciate – the first mouthful of broth doesn’t always reveal the full richness of flavour that builds as you get further in. This is certainly the case here. There is a stronger fishiness than most places dare to serve, and the other half is thrilled. 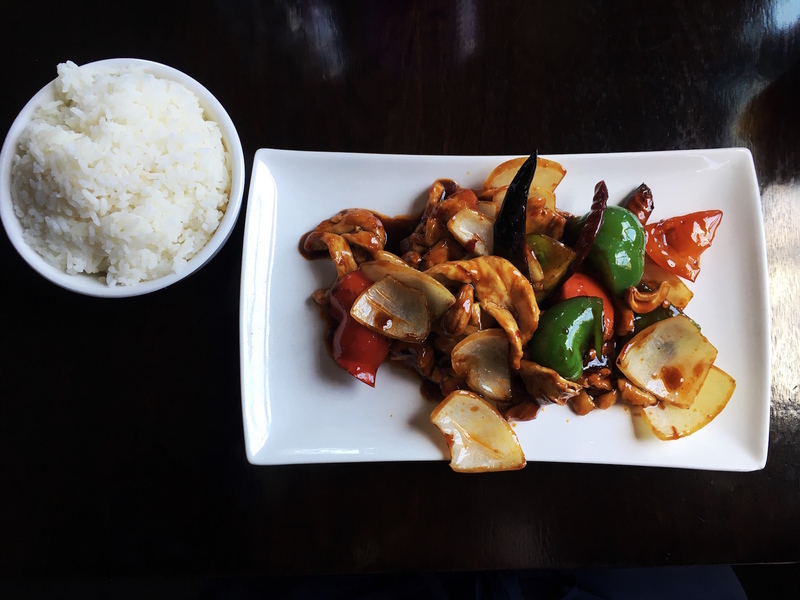 I go for the kung pao chicken with rice from the list of specials ($9). The sauce is slightly sweeter than I’m used to – it’s a winner in my book. Roasted cashews add crunch and the dish isn’t overly spicy (until I eat up the whole chillies for some welcome heat). The other half has to fight with our offspring for the cold teh tarik, which is strong and nicely sweet, while I just grab a soft drink. All up our bill comes to $32 and we can barely finish the roti. Sambal Kampung is a family gem – like so many Asian restaurants it welcomes kids without needing to cater specifically for them. The food arrives quickly and the prices are terrific. We will be back with our older son very soon. ← Westie barbers No.5: Coffee with your cut?